The Teixeira Tech Honda TRX 450R DZ Frame Gusset Kit is a 41 piece kit that hits all the necessary stress points. 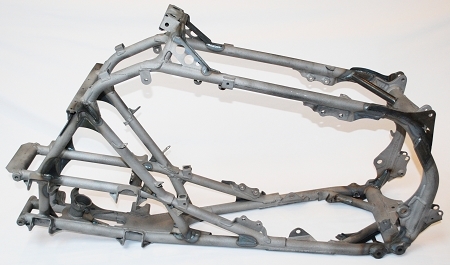 Teixeira Tech Gusset Kits are enginnered to strengthen the oem frame with small gussets that still allow frame flex. Our gusset kits are cut using a CNC Waterjet machine for the utmost in precision and accuracy and CNC milled 4130 chromoly tubing. A waterjet machine does not generate heat thus there is no distortion to the metal. Please click here for an installation guide. Over 3500 miles on our race quad without any cracks in the frame. Used by: Ed Teixeira & Todd Hunter to win the 2007 Vegas to Reno Race and 2007 Best in the Desert championship.